The Synanceia horrida is a remarkable organism when it comes to survival based adaptions. When faced by possible predation the S. horrida relies on its innate camouflage abilitoes, and venomous spines that protrude from its body. 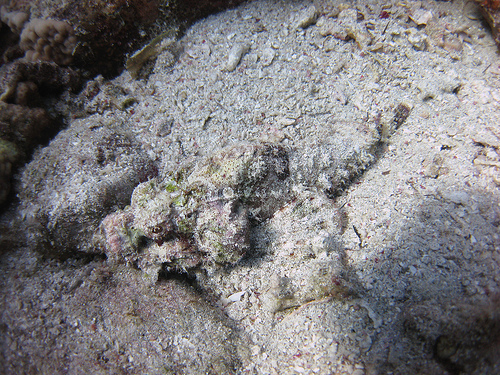 The same camouflage that it uses to hide from predators is also used to surprise unsuspecting prey. 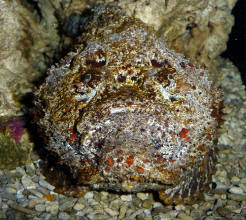 The Synanceia horrida has irregularly shaped reddish-brown skin that gives it a stone-like appearance, hence the nickname stonefish. T his stony appearance allows it to blend in almost perfectly with the coral reefs that it chooses to inhabit. S. horrida's pectoral fins are also used to aid in camouflage, as they are used to stir up sediment at the sea floor, half covering it in sand. S. horrida is an extremely venomous fish, with the Guinness book of world records actually labeling it as the most venomous fish in the world. It had 13 spines located along its dorsal fin that contain its potent venom. All it takes it one small prick from a single spine for extreme damage to occur. Can cause severe muscle necrosis. The myotoxic effects of the S. horrida venom can also cause almost instantaneous paralysis which eventually leads to death due to aphragmacticdiaphragmactic paralysis. S. horrida venom can cause an occurrence of heart electrophysiology dysfunction or/and muscle damage. The stonefish venom causes alterations in the normal activity of the nervous system resulting in damage to the surrounding nervous tissue. Oxygen flow to the wounded area decreases causing the skin around the puncture site to become white as it begins to decay. Based on this this study, one of the main effects of S. horrida's venom is its powerful vasorelaxant properties, which causes extreme hypertension.